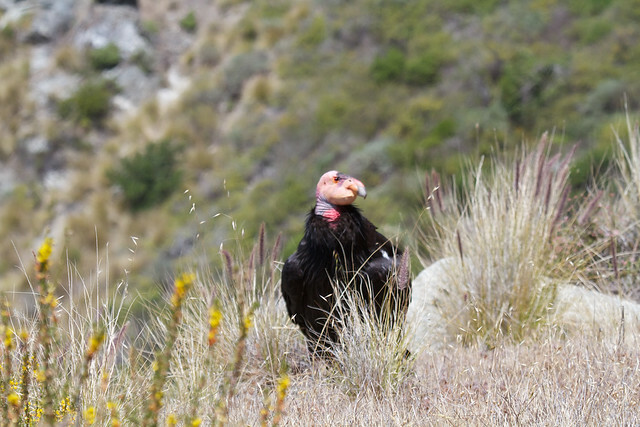 Over the last few years, I have had good luck spotting and shooting California Condors along the Big Sur coast. 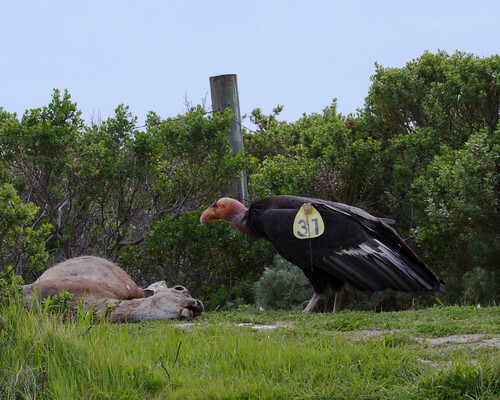 Given that there are less than 200 California Condors in the wild and less than 20 along the Big Sur coast, my luck has been extremely good. So I wasn’t surprised when it appeared that my luck had run out. We took a drive down to Pfeifer Burns State Park, hoping to see condors along the way. 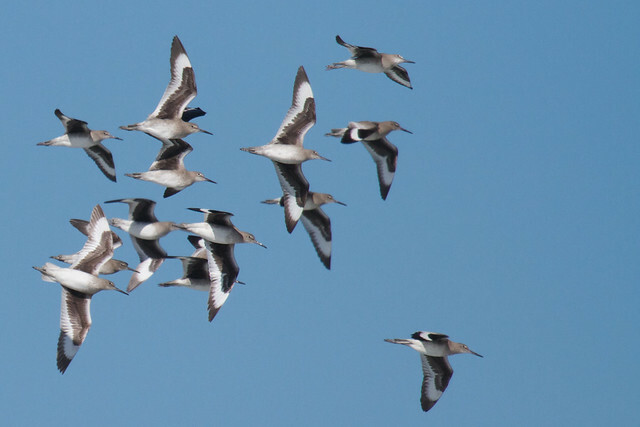 When we didn’t see any there, I was hoping to spot some soaring above the park. Again not much luck. 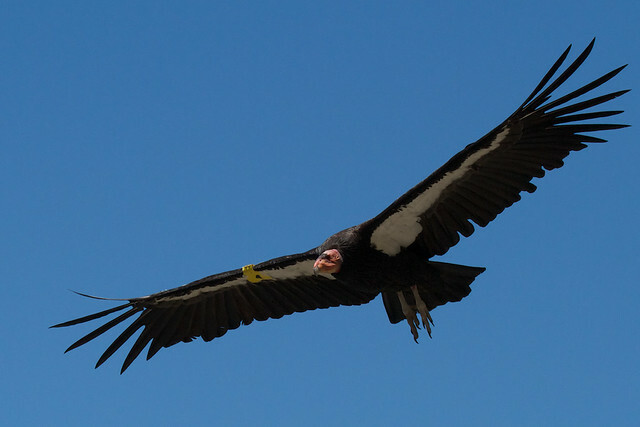 I did spot a couple soaring way up at the top of the canyon, but I couldn’t confirm that they were condors. And the images certainly weren’t anything to write about. 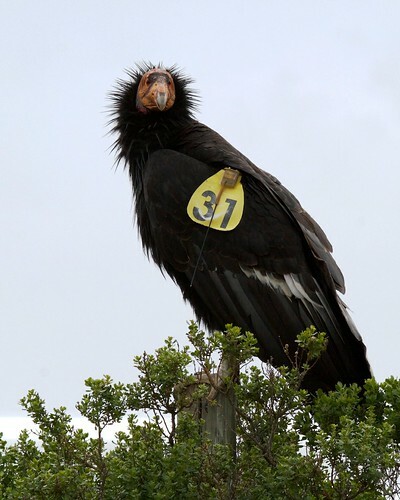 Our driver asked me if she should turn around, “Oh yes!” We went back and saw the condor waiting on a fence post above a road kill deer. Another u-turn and we parked on the opposite side of the road about 50 ft from the condor. After a few minutes she hopped off the fence and went over to feed on the deer. I think my luck is still holding. I am not sure why I like this shot so much, but I do. 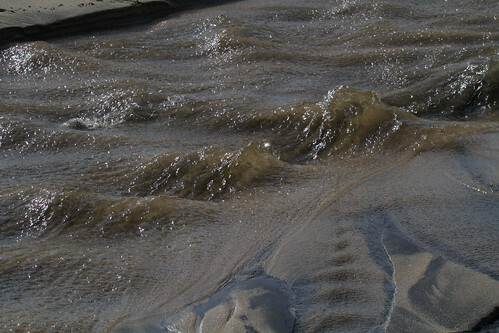 I took it during the second set of king tides that we had at the Reserve this winter. 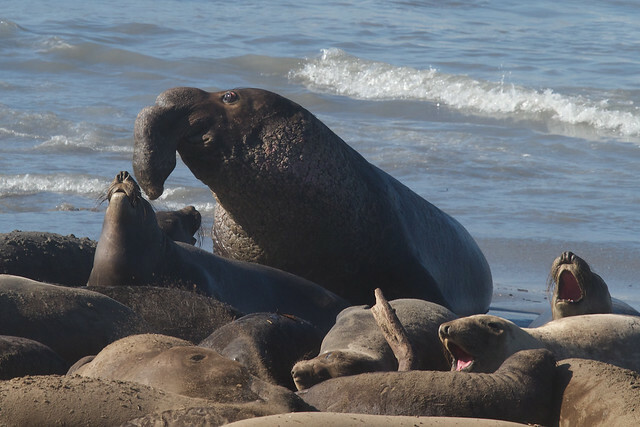 These are times when the interactions between the rocks and water come to the fore. It is a good time to shoot. Yes, it is that time of the year again. If you follow me on Flickr, you probably know most of these shots, because they been sitting in my Best of 2010 set for a good chunk of the year. 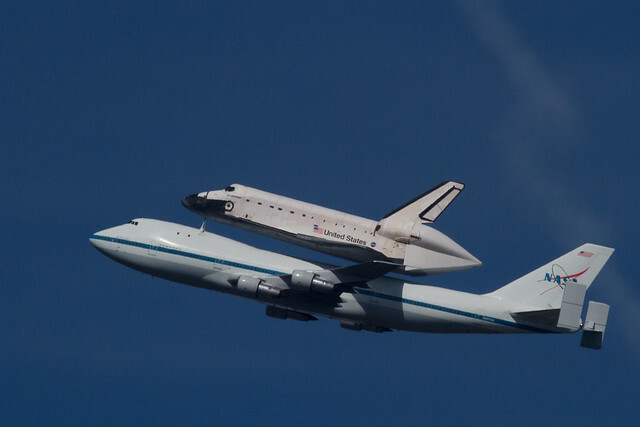 But I did get some good shots yesterday, so there may be a wrinkle or two in the final list. As always, this list goes to eleven. 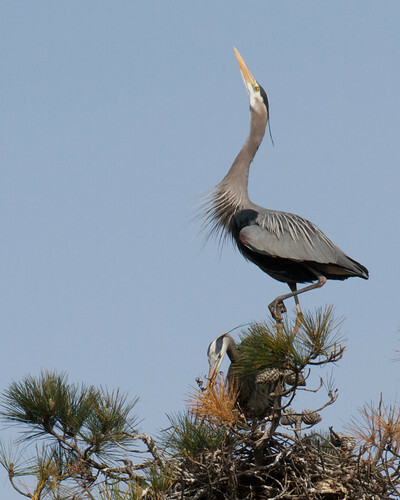 I’ll start with the nesting Great Blue Herons. There is just something majestically silly about proclaiming yourself the worlds greatest twig collector. 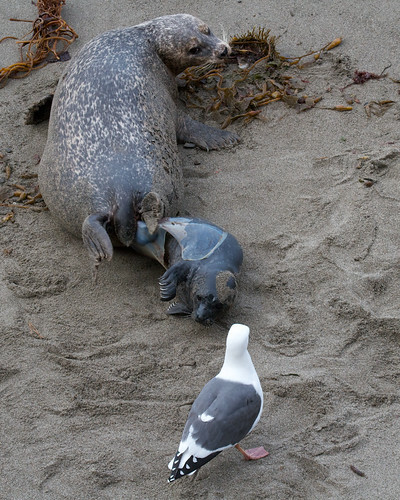 I captured a Harbor Seal birth, with Mom and the pup eyeing the gull. 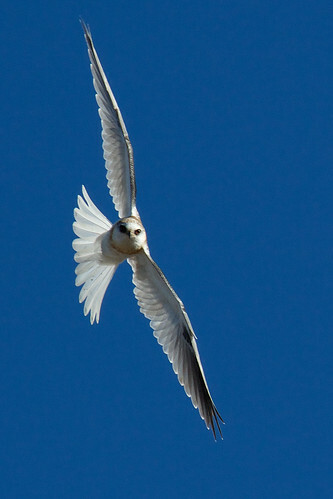 This White-tailed Kite gave me multiple opportunities to shoot it while circling over Mound Meadow. MPC Softball, I hope to get to more games this season. 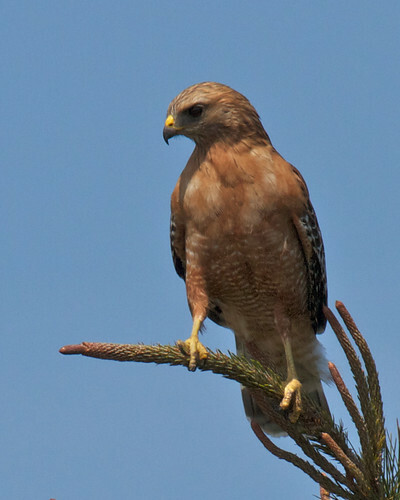 Red-shouldered Hawk in a pine. 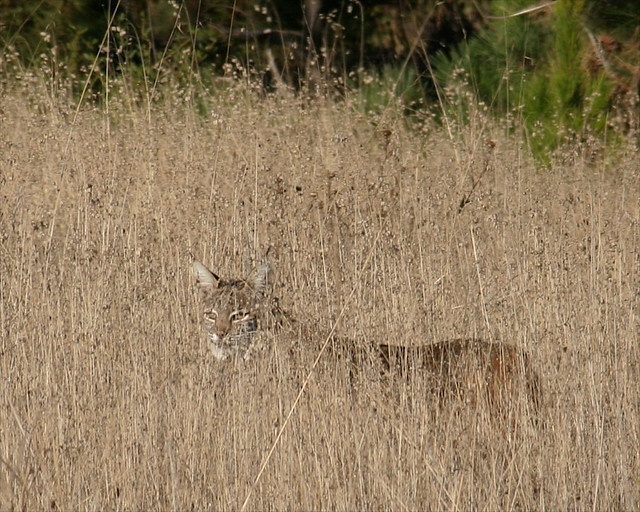 I was walking down the trail and saw binoculars seemingly focused on me, so I turned around. 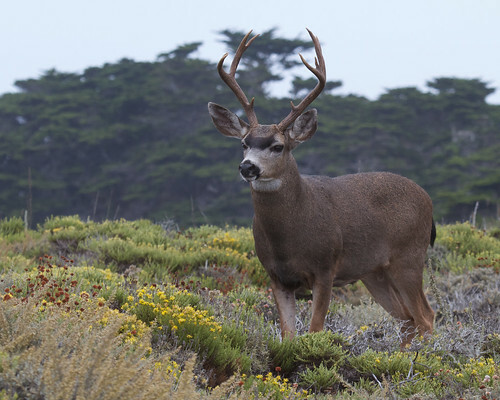 This guy was so focused on the doe ahead of him that I could have gotten closer, but then I would have had to change my lens. A very late addition, but how can I skip a nice shot of antidunes. 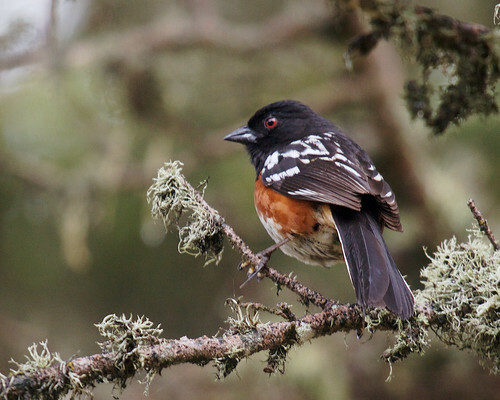 In a surprise move, I selected this Spotted Towhee shot over the one that I had I’m my “Best of” set. 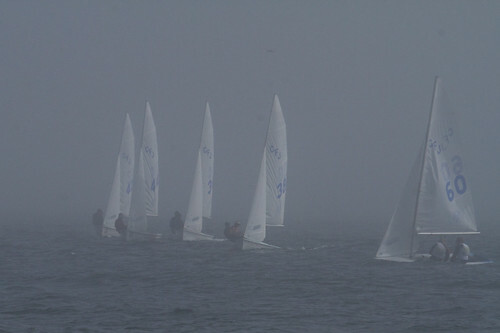 Another surprise, this shot of the Sea Otter Regatta, beat out a shot of a real Sea Otter with her pup. Oh well, the decision of the judge is final. 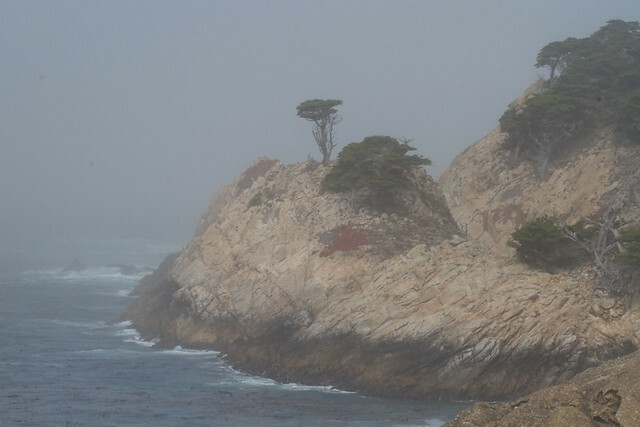 That’s my submission to the Carmel Art Institute’s “The Magic of Point Lobos” competition and exhibition. All five were accepted and will be on display from September 28 to October 18. 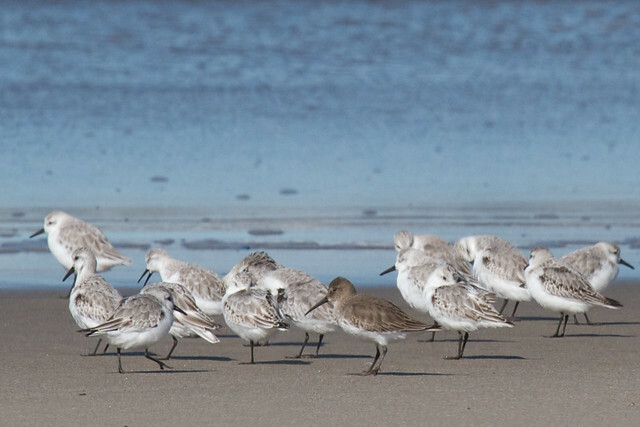 Let’s start with the birds. They are similar shots, a Black-crowned Night Heron and a Snowy Egret, both are tense and searching for food. 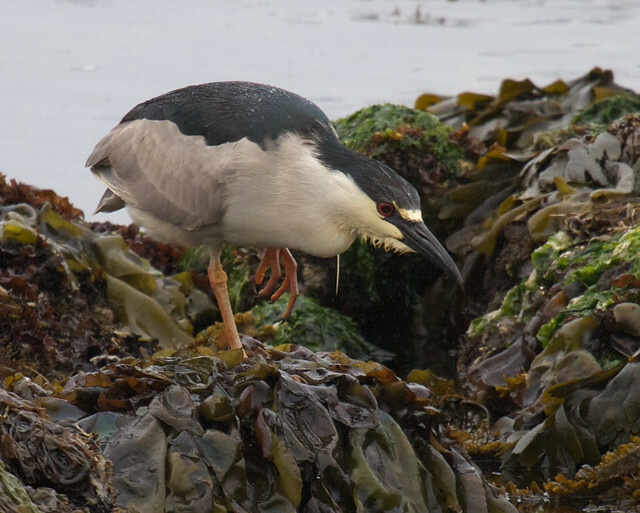 The primary difference is that the night heron is on a rock and the egret is on floating kelp. 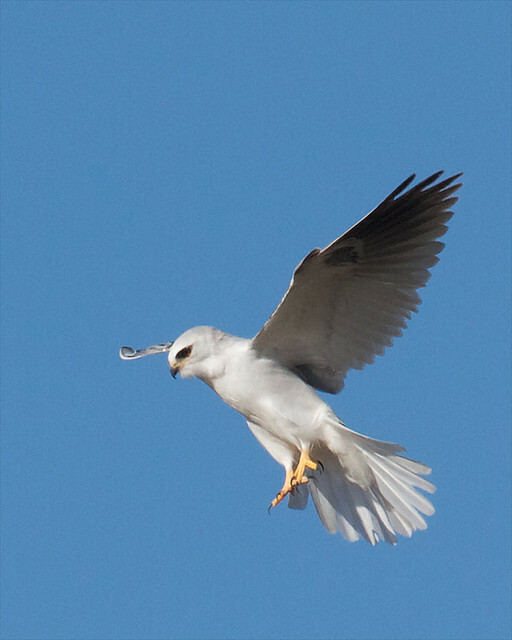 That and the egret is a striking white. The wave shots capture the magnitude of a big wave day at the Reserve. These are days when you feel and smell the waves as you drive in. 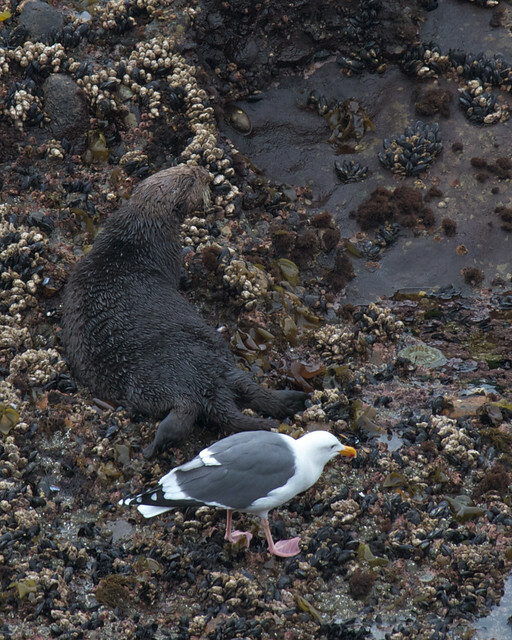 The first stop is Sea Lion Point, where a few young sea lions missed the memo about getting off the rocks. Down at Bird Island the waves can get so big that they climb up to join the clouds and generate water falls where they don’t exist. And we finish with the cat. A bobcat in Mound Meadow to be exact, looking very regal like his cousins in Kenya. 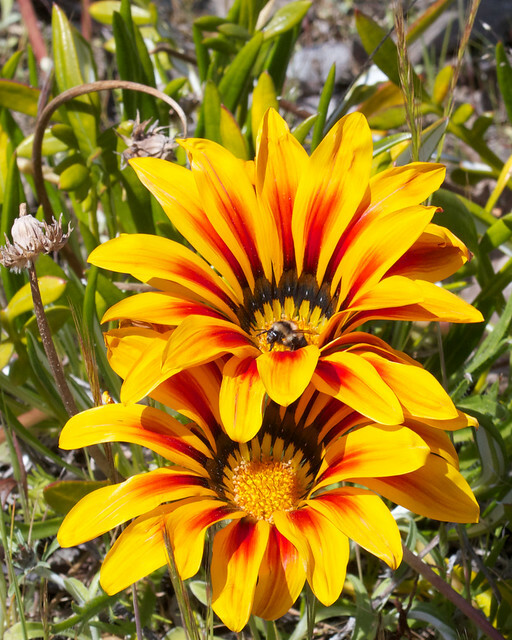 One of my photos is going to grace the walls of the Museum of Nature and Science in Dallas, Texas. 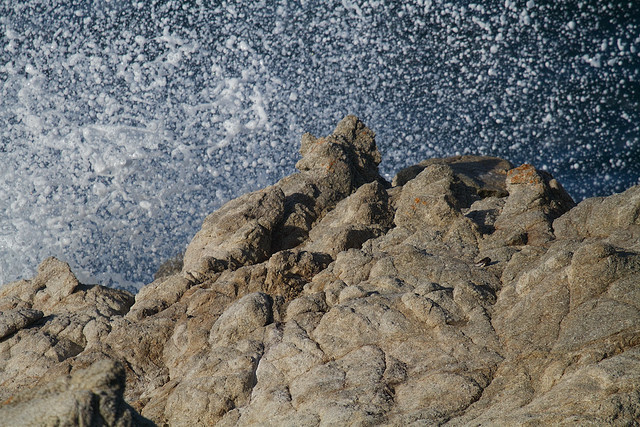 The shot is one of limpet scars on the rocks at Point Lobos. The image will be used in the “Ocean Life in Dallas” section as an example of modern limpet scars. 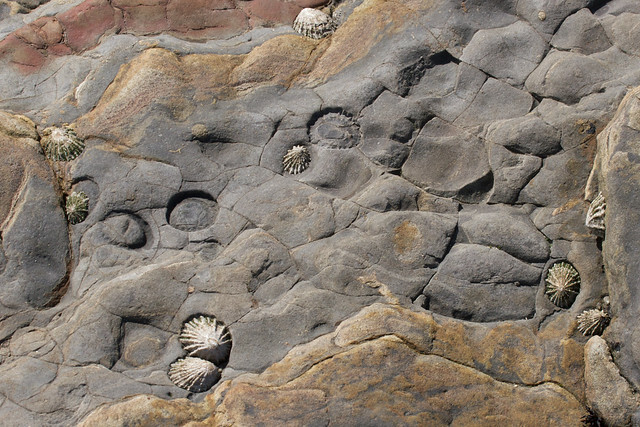 Limpet scars are one hypothesis for the holes found in sea turtle shells from the Mesozoic. 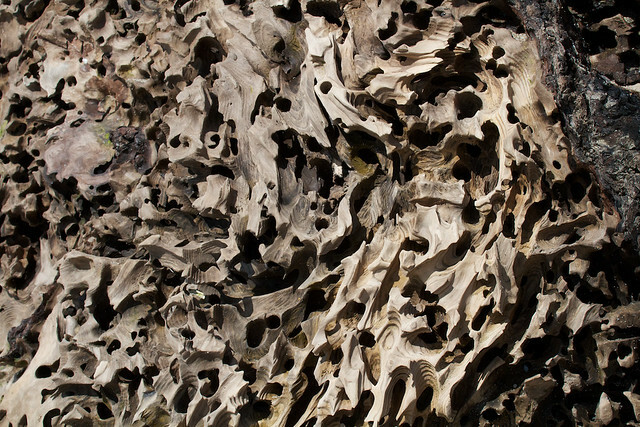 The other hypothesis is that the holes are the result of the bite of a mosasaur, a large, carnivorous sea-reptile. If I were a gambling man, I would bet on the mosasaur. Anyway, it is going to be a “permanent exhibit” and should be around for a few years. So, if you are in Dallas, as Joe Bob would say, “check it out”. This morning my phone buzzed. A former neighbor and San Jose historian passed away. Did I have a picture that could be used in his obituary? To answer that required a dive into the archive. And it required diving into my memories of Jack Douglas. For reasons never quite clear, other than I volunteered to do it, I became the editor of the Naglee Park neighborhood newsletter. So every few months Jack would show up on my doorstep with a folder containing a computer disk and a hard copy of his history column, with explicit instructions to return the folder and disk when I was done. It was the easiest page to fill in the newsletter. Jack was able to bring the history of our little neighborhood alive. He literally wrote the history of Naglee Park. 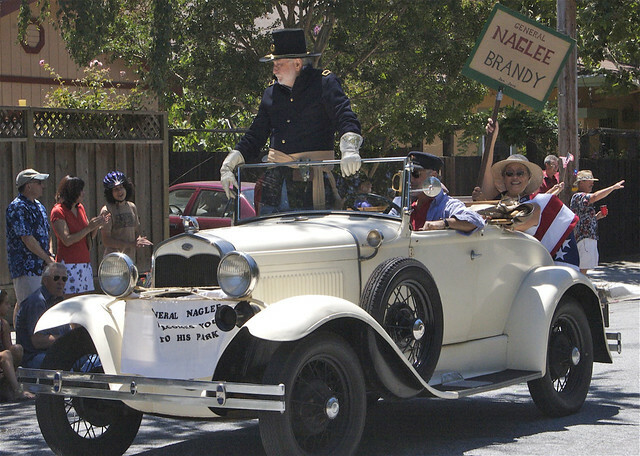 And for years he played the part of General Naglee in our neighborhood 4th of July parade, bringing that history to generations of new neighbors. The San Jose Mercury News used this photo of Jack as General Naglee in it’s obit today. They gave me a credit, but I would rather have Jack. Thank you Jack for teaching me about the history of my city and neighborhood. With pitchers and catchers reporting to Spring Training tomorrow, there is a baseball buzz in the air. Of course, the colleges started their seasons last week. While I missed Monterey Peninsula College’s home opener last week I wasn’t going to miss their second home game. And after this morning’s game, I have managed to double the number of ball games that I went to last year. 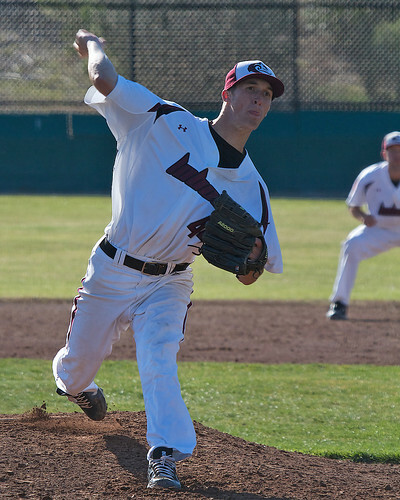 For those of you interested in just the baseball, the MPC Lobos started the season with five wins. They lost their first game this morning. Most of the wins were come-from-behind affairs with the winning runs scored in the ninth or extra innings. Their defense has been a little shaky, with 5 errors in the last 2 games. The Lobos have shown that they have the offense to overcome the errors, but it would be better not to make them in the first place. Now let’s get back to photography. Every ball field is different and you need to learn where the good sight lines are for shooting the game. College fields are generally bad for shooting because they are surrounded by chain link fencing. You can shoot straight on through the fence at distant objects, but if you are trying to catch action at an angle through the fence, forget it. 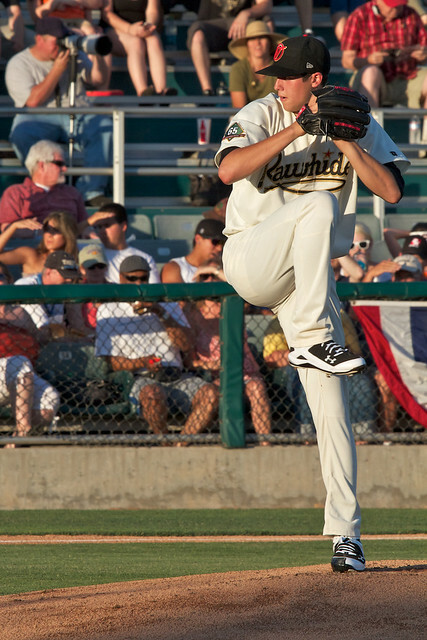 Starting Pitcher Rob Kovach, through the netting. In contrast, Minor League stadiums will have netting behind the batter, but only low fencing around the rest of the seating area (the same is true of Major League stadiums). 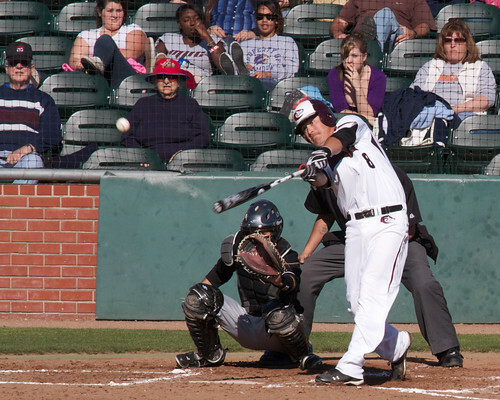 When I shoot Minor League games, I can park myself down the first or third base line and have an unencumbered view of nearly any play in the infield. I can shoot the batters in the box from either side (depending on whether they were batting right or left). I can shoot the play at first base (the most common play in baseball). The way the MPC ball field is situated, however, these shots are impossible to get. There are basically two places where you can get unencumbered shots. The first is at the net behind home plate, shooting through the net is not an encumbrance if you are close enough to it. 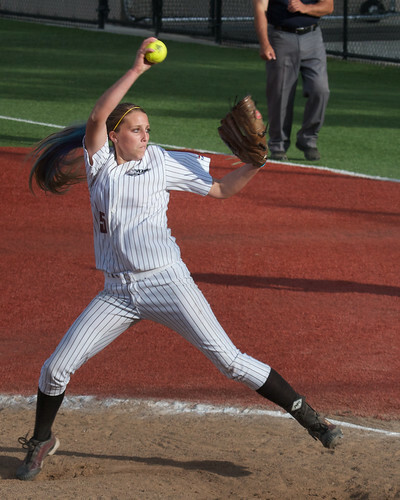 This is a good place to shoot the pitchers, though you are a little too far behind the batters to get a good shot. My biggest concern about shooting here is making sure that I am not in the sight line of a fan watching the game. This is a place to move in take a few shots and move on. 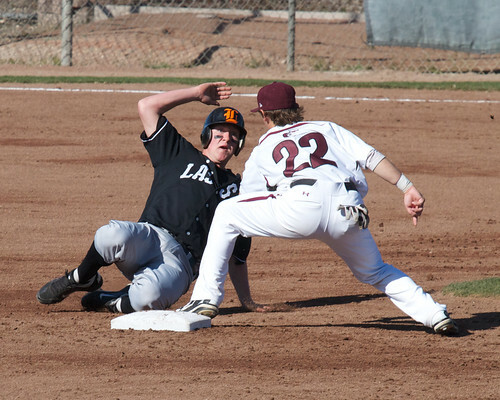 Max Price delivers a caught stealing out. The second is behind the outfield fence. This is a new one for me, because most Minor League stadiums that I have been to, don’t have seating or viewing out there. They have a big wall with advertising plastered across it. MPC has through the chain link viewing in right field, but in left field you can get above the fence and have a clear view of the field. The outfield sight lines are exciting because I’m getting to see action that I never did before. You can get batters facing you, and get an entirely different perspective on plays at second base (where before I only saw the back of runners heads, now I see their faces and expression. And I don’t need to struggle to get shots of the outfielders. So once again, baseball season’s come around and once again, I’m having fun with it. 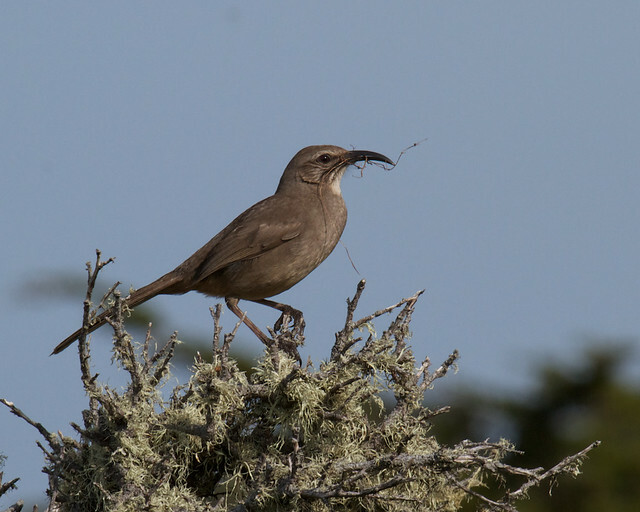 The California Thrasher is one of those birds that literally tell you that you in central California. 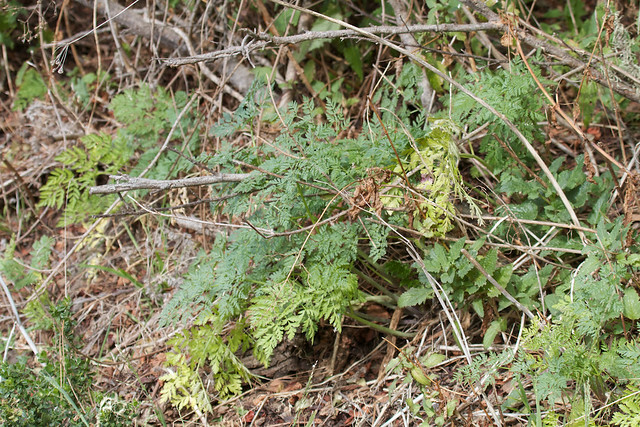 Its song is so ornate and complex that when you hear it you say, “There’s a thrasher nearby”. 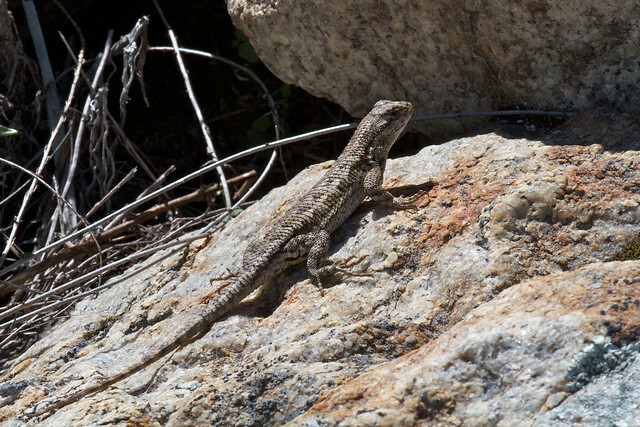 They will also pop up to the top of the bushes and let you get a nice shot. Thanks! Apparently the summers on the southern coasts of Oregon and Washington had an impact, because I am always trying to capture where the world fades into the fog. Ok, I cheated on this image. 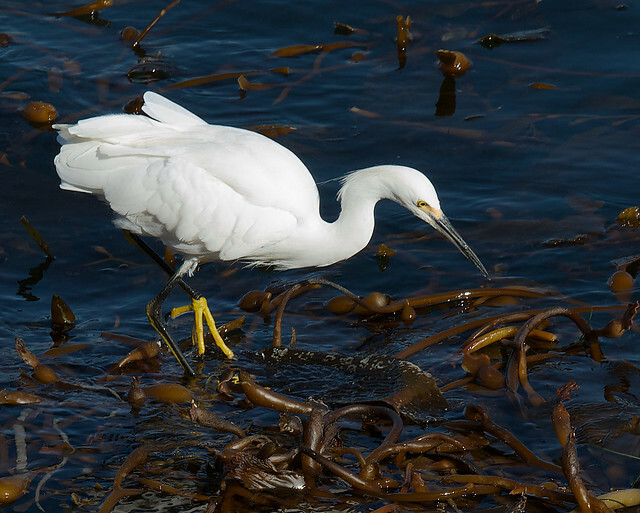 I photoshopped out a distracting kelp float that was right by the bird’s bill. It was like a giant zit on your prom photo. Other than that, I really like the shot. This was my miniatures entry this year. 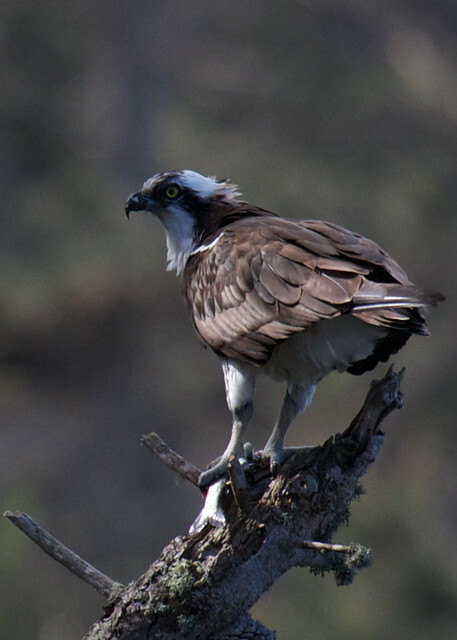 I had heard about the Osprey at Pt Lobos but hadn’t seen it. 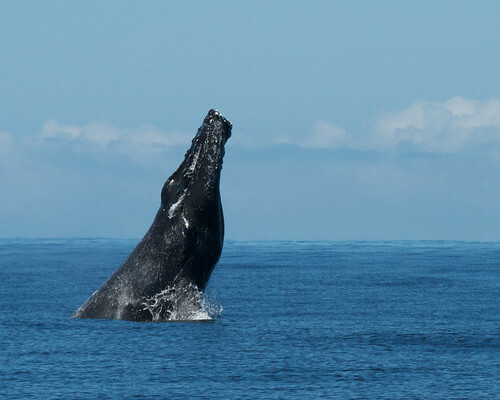 Then one day it showed up in front of me and then put on a show while devouring lunch. I wasn’t sure which was the better shot from the day, my brother absolutely giddy after seeing condors up close, or one of the condors. 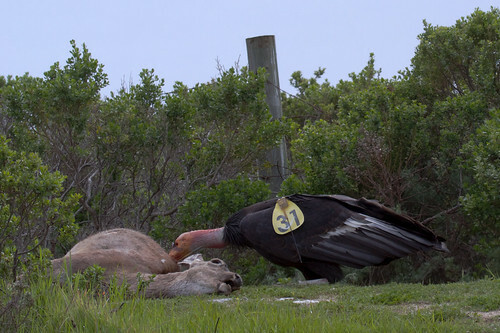 But I recon’ that you’d rather see a picture of a condor than my brother. 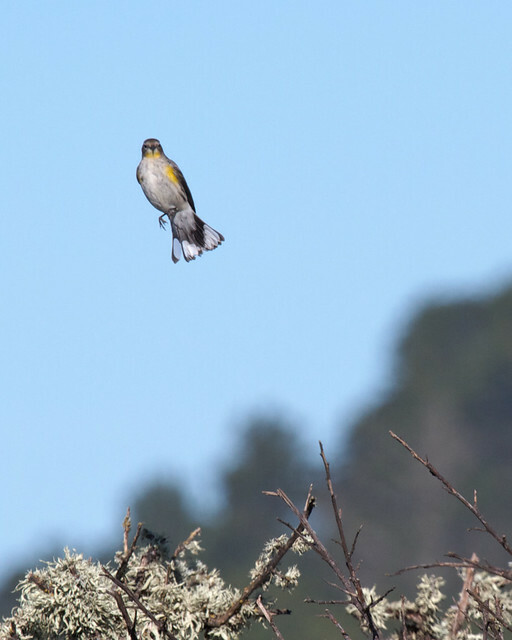 Catching birds in flight is one of the most challenging things I attempt with a camera. When I pull it off, I’ve got to show it off. One of the few shots that I planned in advance. 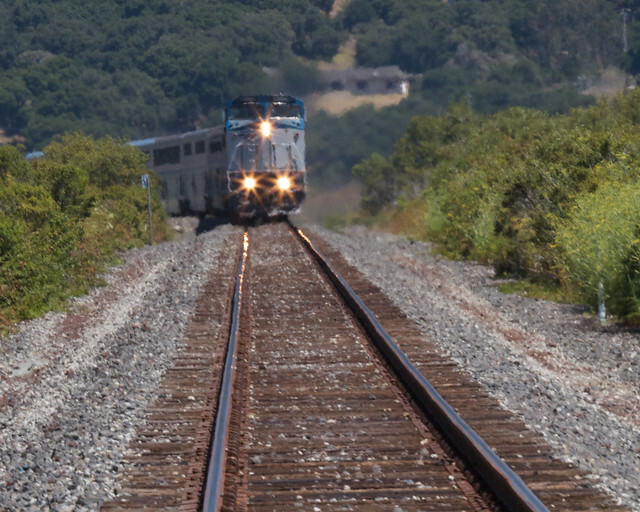 Get there ahead of time, set up for the shot, take the shot, and get the hell off the the tracks! 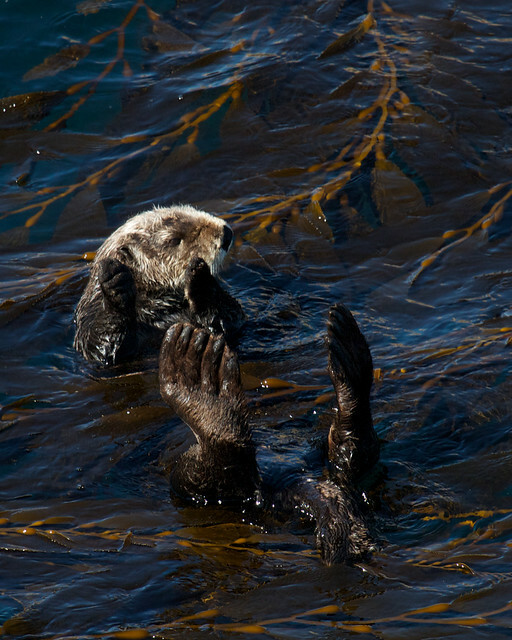 Is it really a collection of shots from Monterey if you don’t have a Sea Otter. 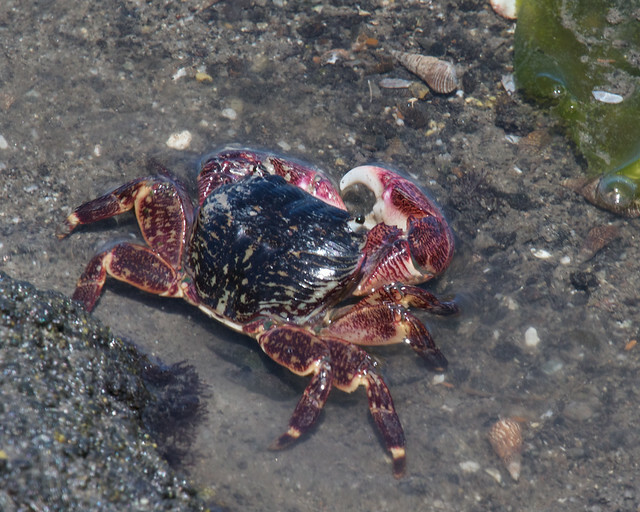 This one seemed to be especially pleased to be spending the day in the kelp. 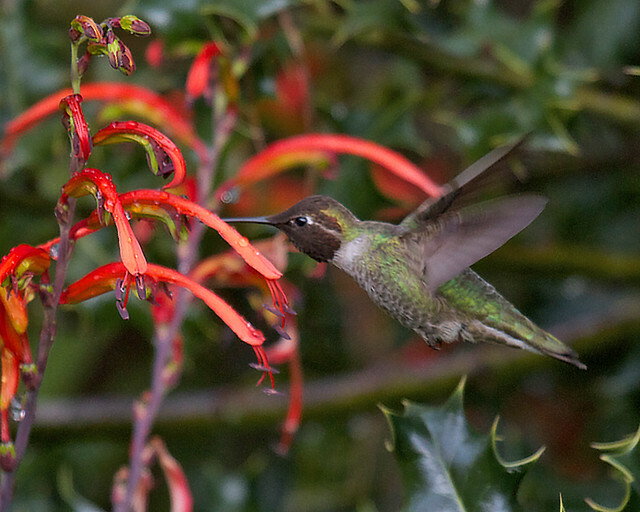 Catching a hummingbird like this is just lucky. Yes, I had pre-set the ISO and the shutter speed so the shot was possible, but getting the bird in it, that is just lucky. The geologist in me notices little things like pebbles getting tossed into the air by an incoming wave. Even if no one else notices, I think it makes an interesting photo.